We're trying to develop an geoplacement app for one of our clients, and we want first to test it in out own domain. But we can't make even the easiest example to run without error. 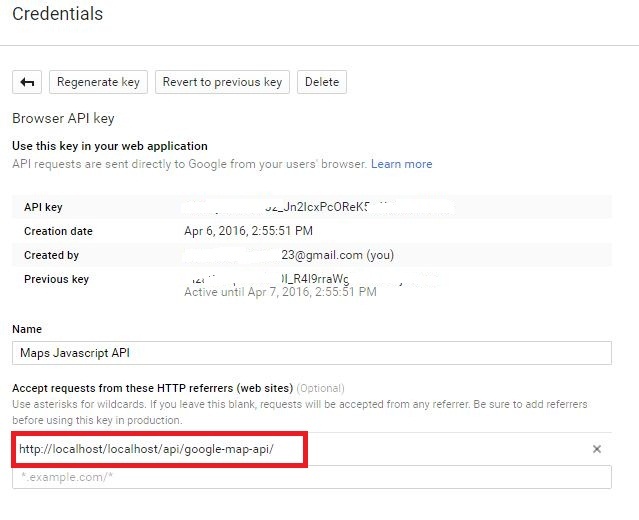 "Google Maps API error: Google Maps API error: RefererNotAllowedMapError (link to Google documentation on RefererNotAllowedMapError) Your site URL to be authorized: (1)"
My credential page is missing the possibility of adding referrers to accept, so solutions involving adding referrers are not possible right now. I know this is an old question that already has several answers, but I had this same problem and for me the issue was that I followed the example provided on console.developers.google.com and entered my domains in the format *.domain.tld/*. This didn't work at all, and I tried adding all kinds of variations to this like domain.tld, domain.tld/*, *.domain.tld etc. What solved it for me was adding the actual protocol too; http://domain.tld/* is the only one I need for it to work on my site. I guess I'll need to add https://domain.tld/* if I were to switch to HTTPS. 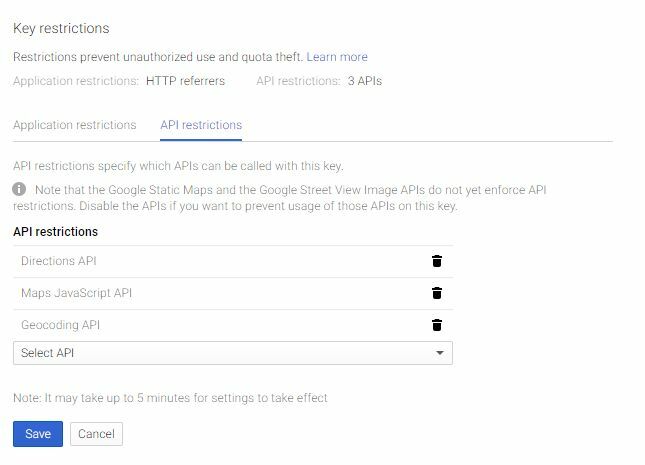 I have the Google Maps Embed API set up for my own personal/work use and thus far have not specified any HTTP referrers. I register no errors. 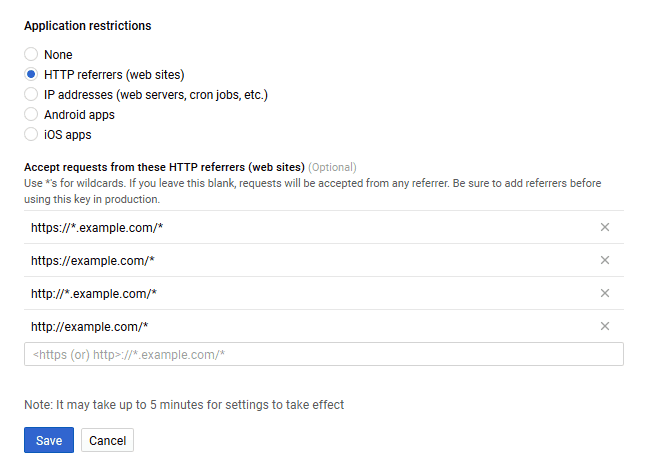 Your settings must be making Google think the URL you're visiting is not registered or allowed. The order in the list is important. Moving your URL up in the list may make it work. Even "localhost" needs it: "http://localhost/foo/bar.html"
A trailing * as a wildcard seems to work as if it is a string compare. For both prod dev, have (at least) two rows: "http://localhost/foo/bar.html" and "http://my.site.com/foo/bar.html"
A port number (8085? 4000?) does not seem to be necessary. There are probably other rules, but this is a tedious guessing game. Just remind that if you just change it, it may take up to 5 minutes for settings to take effect. So,Please configure http://testdomain.com domain, then your http://www.testdomain.com will start work. Check you have the correct APIS enabled as well. I tried all of the above, asterisks, domain tlds, forward slashes, backslashes and everything, even in the end only entering one url as a last hope. There are lots of supposed solutions accross several years, and some don’t work any longer and some never did, thus my up-to-date take working per end of July 2018. Actually using the pattern from the placeholder: <https (or) http>://*.example.com/*. Not omitting the protocol, but adding two entries per domain (one per protocol). An additional entry for subdomains (with a *. leading the hostname). I had the feeling that the RefererNotAllowedMapError error still appeared using the proper configuration (and having waited ample time). I deleted the credential key, repeated the request (now getting InvalidKeyMapError), created new credentials (using the exact same setup), and it worked ever since. Adding mere protocol and domain seemed not to have included subdomains. 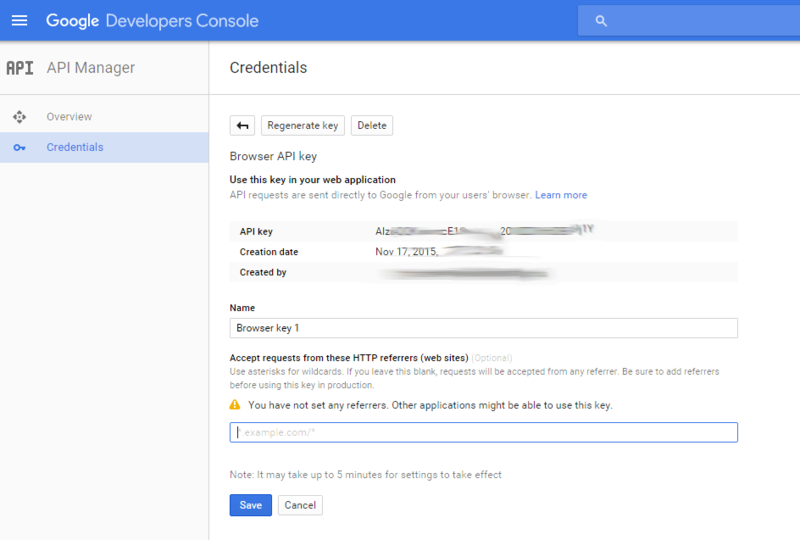 you show a screenshot of your api credentials page, but you have to click on "Browser key 1" and go from there to add referrers. It seems that the * will not match / or get into deeper paths.. This will give your full domain access, well unless you have deeper nesting than that..
That fixed the problem for me. I add 2 website domains, set "*" in subdomain is not working but specific subdomain "WWW" and non-subdomain have been worked for my websites using the same Google Map API key. Wildcards (asterisks) ARE NOT allowed on subdomains. Forget what Google says on the placeholder, it is not allowed. http://www.example.com/* has worked for me after days and days of trying. None of these fixes were working for me until I found out that RefererNotAllowedMapError can be caused by not having a billing account linked to the project. So make sure to activate your free trial or whatever. That your website is added to the referrers in your app. 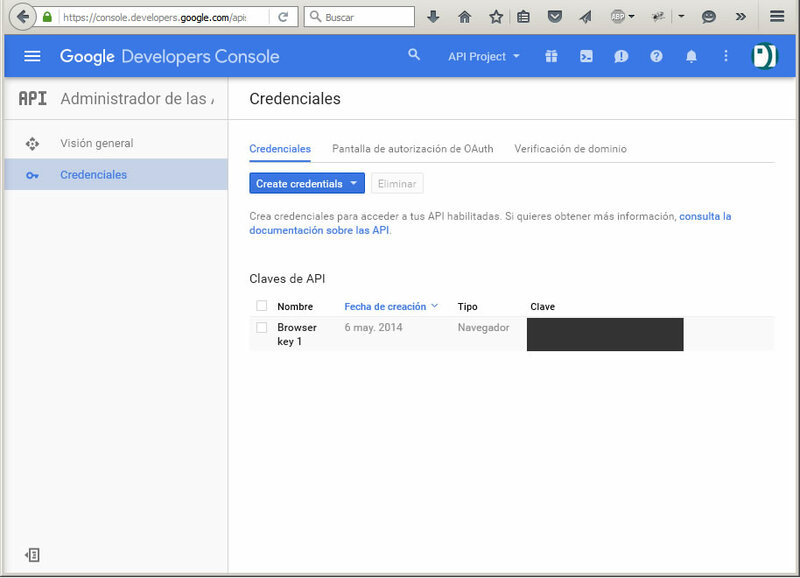 That the website has been added to your DNS to enable your Google Console above. Removing the restrictions (to None) worked for me. Why does Google keep saying that my site needs to be authorized when I've entered this value?